While I'm not there at the moment (February is our annual trip to family and friends in America. 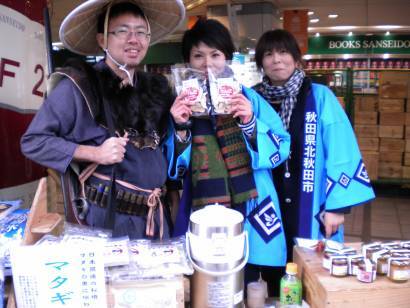 ), Tokyo's Farmer's Markets carry on and promise to be as good as ever. While the plums get ready to blossom and the camellias are already showing off, make plans to spend some time at one of these great markets! Photo Note: Taken at the Yurakucho Farmer's Market featuring Akita growers and producers. Now that was a yummy few hours! An errand last month found me happily face to face with the Kichijoji Market in all its glory, despite heavy, cold rains. A terrific two days of seasonal vegetables, fruits, homemade treats, and even some fun activities for those whipper-snappers! Note too, a December visit to Tokyo's Earth Day Market revealed the occurrence of a new occasional organic market in Kichijoji. This one takes place in Inokashira Park - a perfect spot for a market if ever there was one - and promises only to grow. I remain hopeful that some of our Mitaka growers will move in and strut their stuff. Watch for the Earth Day version the first weekend in March! I could go wax on forever about how great this market is and how important it is for the future of Japanese farming. Instead, I'll just insist that folks go and see for themselves what great things the market and these innovative growers are doing. This month will also feature a great selection of organic wines and some nifty music! Another great market somewhere in size between Kichijoji and the United Nation's Univeristy Farmer's Market, it often features from a particular growing region as well as heaps of farmers and producers from nearby Chiba and Saitama, too.